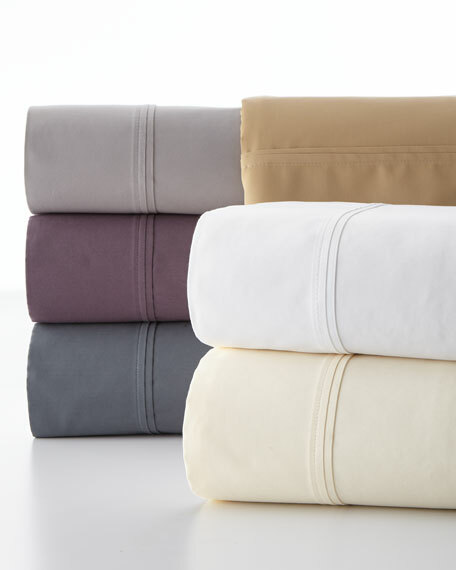 Supreme soft finish and wrinkle free sheet set. Set includes: one flat sheet (96" x 106"), one fitted sheet (60" x 80"; 17" pocket; fits 20" mattress), and two pillowcases (21" x 32"). Double pleat hem on flat sheet and pillowcase. Wide elastic on fitted sheet for better, more secure fit. Set includes: one flat sheet (116" x 106"), one fitted sheet (78" x 80"; 17" pocket; fits 20" mattress), and two pillowcases (21" x 40"). Set includes: one flat sheet (84" x 96"), one fitted sheet (54" x 75"; 17" pocket; fits 20" mattress), and two pillowcases (21" x 32"). Set includes: one flat sheet (116" x 106"), one fitted sheet (72" x 84"; 17" pocket; fits 20" mattress), and two pillowcases (21" x 40").